Anyone who has used PowerPoint will know how much time and effort is required to create a presentation with the right mix of slides, images, text, etc. A professionally made presentation is likely to be a result of several hours of work and losing it is not an option, especially just before the presentation is about to start. However, sometimes PowerPoint presentation files can get damaged due to various factors including a virus infection, hard drive failure and the like. 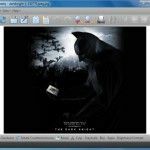 In fact, it should not be very surprising if a PowerPoint file is damaged when your system suddenly shuts down when you are working on the file. In such a case it can be nearly impossible to redo the entire presentation and one can only hope to recover the damaged file somehow. If you have suffered from any of the aforementioned issues and need to quickly recover your PowerPoint presentation file, then Stellar Phoenix PowerPoint Recovery might just be what you are looking for. 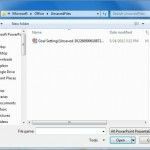 As the name suggests, it is a software for recovering corrupt PowerPoint presentation files from PPT, PPTX and PPTM formats. One of the biggest advantages of using this software is that it not only supports repair for common PowerPoint presentations but also supports recovery for the macro-enabled PPTM files. 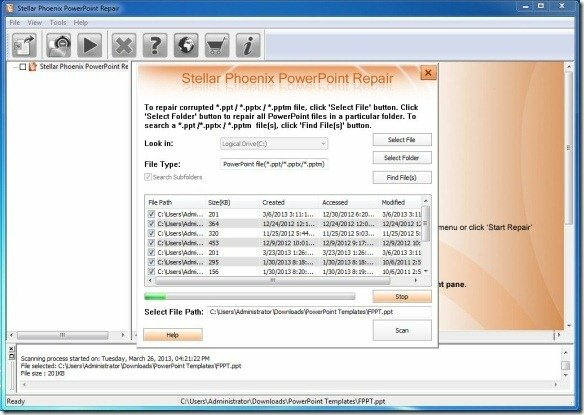 To get started, launch Stellar Phoenix PowerPoint Recovery and select a file or folder to recover files from. The Select File option is meant for selecting individual files, whereas you can repair PowerPoint files in bulk from a specific folder using the Select Folder option. You can even enable Search sub-folders option to repair files from sub-folders. When a file is being repaired, a bar displays the progress of the recovery process. You can also see basic information regarding the recovery process from a log that is displayed on the bottom pane. 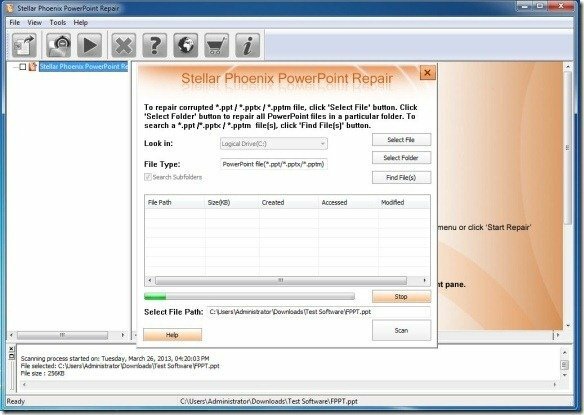 Are you looking for a Stellar Phoenix PowerPoint Repair tool to fix and recover PowerPoint? If yes, then go ahead with Remo Repair PowerPoint tool for quick results. Thanks for sharing. Have you used Remo Repair PowerPoint tool with success? 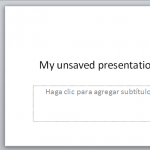 Can please share more info about your experience repairing a PowerPoint presentation file? Was it a PPT presentation or a PowerPoint template? For which version of Microsoft PowerPoint? When you edit a presentation, PowerPoint creates a temporary copy of the file. This temporary file is named PPT####.tmp. Note #### represents a random four-digit number. This temporary file may reside in the same folder as the presentation. Alternatively, it may reside in the temporary file folder. Click Start, and then click Documents. Look for a file that is named PPT####.tmp. In the Open box, type %userprofile%\My Documents. If you do not find the file, you must search for it. To do this, go to step 2. If you do find the file, go to step 3. Click Start, and then type PPT*.tmp in the Start Search box. In the Named box or in the Search for files or folders named box, type PPT*.tmp. In the Look in box, click My Computer, and then click Find Now or Search Now. Right-click the file, and then click Rename. In PowerPoint 2007 click the Microsoft Office Button, and then click Open. In PowerPoint 2010 click the File menu, and then click Open. Browse to the folder that contains the renamed file. Try to open the file in PowerPoint. Note More than one file may correspond to the temporary file that was created the last time that you saved the presentation. In this case, you may have to open each file to see whether one is the temporary copy of the presentation. Thanks for elaborating the solution.